In my experience, people tend to fall into two categories in the Bathroom Towel & Rug Department. 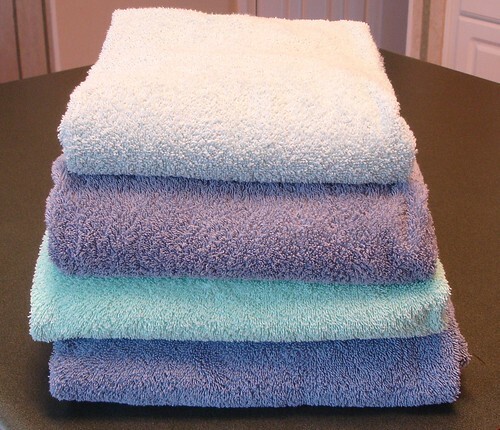 With towels, people either use one every day/every other day or they only switch once every couple of weeks. In washing bathroom rugs, people seem to wash regularly once a week or they rarely wash it at all (if ever). Well, that seems logical, but here’s the real deal: every time you use your towel to dry off, you’re scraping off dead skin cells. And those dead skin cells collect in the fibers of your towel. So if you use your towel for 10 straight days, you have 10 days’ worth of exfoliated cells on that towel. And keep in mind, this rule of thumb only applies if you hang up your towel after every single use. It needs time to dry between uses so yucky things don’t breed and cause mold and mildew. Besides the fact that mold and mildew are hard to remove from towels, the thoughts of mildew being on a towel I am using makes me cringe. If your rug has a non-skid rubber backing, it can’t tolerate being washed frequently. It is best to wash a bathroom rug on warm/hot, and the rubber backing will deteriorate quickly if it is washed on hot too many times. Rubber and hot water and not a good mix in terms of durability. To maintain a bathroom rug that has a rubber backing, only wash it once ever 3-4 weeks. If a bathroom is used frequently, rugs need to be washed weekly. If several showers are taken in the same bathroom on a daily basis, the rug gets wet/damp multiple times. Since the rug is against a floor that doesn’t breathe well (if at all), it takes a long time to dry. Because of this poor drying between uses, mold and mildew grow easily. It really is the perfect condition for gross things to multiply quickly. Again, the rug doesn’t have time to dry out well between uses and harbors all kinds of fungi and mold. Add in a damp, warm bathroom and that mold is just waiting to multiply. All bathroom rugs should be washed on at least a warm water setting. I honestly prefer washing rugs on hot, as hot water routinely gets items cleaner. And I want the item I’m stepping my freshly washed feet on to be clean. If your rug has a non-skid rubber backing, it is best to let it hang dry. Hang it over the shower rod or use your portable clothesline or a real clothesline if you have one. The rubber backing will stay intact so much longer if you don’t mix it with dryer heat. If the rug does not have a rubber backing, feel free to put it in the dryer. It will take a long time to dry, since it is so thick. How to Revive Smelly Towels – Have towels that smell horrible, even when clean? Here’s how to fix them. And in case you’re thinking about making some changes in your own bathroom this year, I’ve got lots of inspiration for you! I’ve teamed up with three other bloggers today, and we’re all talking about bathrooms! Go check them out for some great ideas! Christine from I Dream of Clean is revealing her method for speed cleaning a bathroom. Andrea from Simple Organized Living is giving instructions on how to clean your shower (and keep it clean) in only 10 minutes a month! Jami from An Oregon Cottage is sharing her lovely decorating expertise with an ultra-cool project. She’s making a new shower curtain by stenciling on drop cloth! Nony from A Slob Comes Clean is organizing her bathroom cabinets according to how her family really lives! Oooohhhh Mama! I have some not so fresh towels right now. Even after extensive presoak with oxi clean, lots of detergent,rinse and repeat, vinegar rinsing in warm water- as soon as my towel is used it smells like a week old used towel! I always dry them to Mojave Desert levels too! I have taken to just bleaching even the colored towels and they have so far stood up to it. I have begun to wonder if after a certain amount of time I have to just get new towels in my Pacific Northwest climate or something. I wonder too about the frontloader. It seems that a big hot tub of water would just wash some things better and allow me to leave the lid up and soak things overnight without the huge sloppy mess of doing this in the laundry sink. We are one towel a day for grown ups around here also because of the climate-I would have to put my towels in the dryer after every shower to keep the bacteria from growing. How about a post on yucky kitchen towels? I use several towels and dishrags a day because of the grossout factor of a wet thing sitting out propagating billions of bacteria. I have met some HIDEOUS sponges and towels at other peoples houses, one I touched with a bare hand and was unable to get the smell off until I got home and used a salt scrub on it. People need to be comfortable with going through a lot of kitchen linens! We are such kindred souls. YES, YES and YES please change the dishtowels. Frequently. A gross dishtowel or sponge just makes my stomach turn. As far as the smelly towels, it may just be your climate. Any time it is perpetually damp, those towels are hard to keep mold-free. Long-term use of bleach is awful for laundry, but in this case I’d use it. I found your site when I got sick of handwashing a dozen kitchen clothes for the second time… We have a huge top-loading washing machine and washing these in it makes me guilty and I wonder if I can wash them with other stuff such as bath towels. I think I have found my answers in the relevant pages. I came back again today when I am wondering whether I can wash kitchen rug, bath mats and bath towels together, but I don’t seem to find any content on this? By the way, I saw the link to 3 reasons why we should not wash towels with our bed sheets and clicked on it. It doesn’t bring me to the right page (goes to the one on how to revive smelly towels instead). Thanks for the really useful site! My friends think I’m nuts, but the way I remember to wash my bathmats regularly is according to my *ahem* monthly visitor. Whenever Aunt Flo comes to visit, that is when all the bathmats get their monthly cleansing as well 🙂 Weird, I know, but I don’t have to remember when they were washed last. Don’t know what I’ll do after “the big change of life” but I think I have a few years to go. You know, Kim, I think that’s really smart! It’s an easy reminder for when they should be washed. I’ve never thought to use that as a reminder, but it would work! My wife and I share both room towel is this ok? And if I do not have a washer,how often do I wash the towel manually and have it clean properly? Attah, I do not recommend sharing a bath towel with anyone. Each time you dry off, your body scrapes off dead skin cells and they can build up on the towel. Can I throw in kitchen, floor, and bathing towels all together in the washing machine? Or should I separate them? If you wash on hot and a normal or heavy duty cycle (choose heavy duty if available! ), yes, that should be fine. If you don’t have super hot water available (like at a laundromat), I’d wash separately. Ms Mama Laundry.. I am a 26 yr old guy who just moved in to his own apartment. I live by myself and I wash my hands and I shower every day pretty much. I use towels for hand drying and drying after the shower..
how often should I be washing these towels If Im the only one using them.. I have alot of towels so I can rotate alot but what is the ideal routine? Once a week for each? Just found your site…love it…so helpful! Please, please, please repost “preventing smelly towels”! When I click on the post from any link…it says error. We have 5 kids…I need the real scoop on the situation 🙂 Thanks so much! I see that all of those links are broken. Thank you for bringing that to my attention – working on it now!